On June 22, 1941, Nazi Germany launched Operation Barbarossa (Unternehmen Barbarossa). The armed forces of Germany and its allies invaded the Soviet Union, quickly advancing deep into Soviet territory. In December, having suffered multiple defeats during the summer and autumn, Soviet forces counter-attacked during the Battle of Moscowand successfully drove the German Army (Wehrmacht Heer) from the environs of Moscow. By spring 1942, the Germans had stabilized their front in a line running roughly from Leningrad in the north to Rostov in the south. There were a number of salients in the line where Soviet offensives had pushed the Germans back, notably to the northwest of Moscow and south of Kharkov, but neither was particularly threatening. In the far south the Germans were in control of most of the Ukraine and much of the Crimean, although Sevastapol remained in Soviet hands along with a small portion of the Kerch peninsula. The Germans were confident they could master the Red Army when winter weather no longer impeded their mobility. There was some substance to this belief: while Army Group Center (Heeresgruppe Mitte) had suffered heavy punishment, 65 percent of its infantry had not been engaged during the winter fighting, and had been rested and reequipped. Army Groups North and South had not been particularly hard pressed over the winter. Confusing matters considerably was the recent entry of the United States following Germany’s declaration of war in support of its Japanese ally. To everyone’s surprise, the new Anglo-American Allies stated that their first priority was Germany. Hitler wanted to end the fighting on the Eastern Front, or at least minimize it, before the Americans had a chance to get deeply involved in the war in Europe. Whatever plan they chose it would have to have sweeping strategic importance. Limited operations, like collapsing the salients or finally taking Leningrad, would simply not force the war to a close. Moscow was thus an obvious target. Capturing Moscow could conceivably force the Soviets to surrender, or at least so upset their command, control and manufacturing to remove them as a major force. However, an important part of the German “Blitzkrieg” style of warfare was to attack at the least obvious point, in order to concentrate the offensive against the weakest defense, punching through, and then maintaining a highly mobile offensive in order to keep the enemy off balance. Moscow was just as obvious a target to the Soviets as the Germans, and was heavily defended as a result. Although a successful offensive was certainly possible, it would likely be a costly victory. Another possibility was to upset the strategic balance by cutting off the Soviet supplies. The basic theory behind total war was that if the industrial output of a country could be disrupted, their military forces would be unable to fight and be defeated as a matter of course. Hitler himself had always claimed to favor this style of warfare, and had personally intervened during Barbarossa to capture areas he felt were of prime industrial importance (much to the chagrin of his generals). In this case there was an obvious target, the oil fields of the Caucasus area, which supplied the Soviets with the vast majority of their fuel. An offensive in this area would also complete the takeover of the Ukraine. If the Volga could be reached, grain supplies from much of the Soviet “breadbasket” would be cut off completely, as it traveled either by barge on the Volga, or trains on lines further west that would also be overrun. The capture of Stalingrad was important to Hitler for two primary reasons. Firstly, it was a major industrial city on the Volga River -- a vital transport route between the Caspian Sea and Northern Russia. Secondly, its capture would secure the left flank of the German armies as they advanced into the oil-rich Caucasus region -- with a goal of cutting off fuel to Stalin’s war machine. The fact that the city bore the name of Hitler’s nemesis, Joseph Stalin, would make its capture an ideological and propaganda coup. Stalin realized this, also, and despite being under tremendous constraints of time and resources, ordered anyone who was strong enough to hold a rifle be sent out to defend the city. The Red Army, at this stage of the war, was less capable of highly mobile operations than the German Army; however, the prospect of combat inside a large urban area, which would be dominated by short-range firearms rather than armored and mechanized tactics, minimized the Red Army’s disadvantages against the Germans. Army Group South was selected for a sprint forward through the southern Russian steppes into the Caucasus to capture the vital Soviet oil fields there. Instead of focusing his attention on the Soviet Capital of Moscow as his general staff advised, Hitler continued to send forces and supplies to the eastern Ukraine. The planned summer offensive was code-named Fall Blau (trans. : “Case Blue”). It was to include the German Sixth Army, Seventeenth Army, Fourth Panzer Army and First Panzer Army. Army Group South had overrun the Ukrainian SSR in 1941. Poised in the Eastern Ukraine, it was to spearhead the offensive. Hitler intervened, however, ordering the Army Group to be split in two. Army Group South (A), under the command of Wilhelm List, was to continue advancing south towards the Caucasus as planned with the Seventeenth Army and First Panzer Army. Army Group South (B), including Friedrich Paulus’s Sixth Army and Hermann Hoth’s Fourth Panzer Army, was to move east towards the Volga and the city of Stalingrad. Army Group B was commanded initially by Field Marshal Fedor von Bock and later by General Maximilian von Weichs. The start of Operation Blau had been planned for late May 1942. However, a number of German and Romanian units that were involved in Blau were then in the process of besieging Sevastopol on the Crimean Peninsula. Delays in ending the siege pushed back the start date for Blau several times, and the city did not fall until the end of June. A smaller action was taken in the meantime, pinching off a Soviet salient in the Second Battle of Kharkov, which resulted in the pocketing of a large Soviet force on 22 May. Blau finally opened as Army Group South began its attack into southern Russia on June 28, 1942. The German offensive started well. Soviet forces offered little resistance in the vast empty steppes and started streaming eastward in disarray. Several attempts to re-establish a defensive line failed when German units outflanked them. Two major pockets were formed and destroyed: the first northeast of Kharkov on July 2 and a second, around Millerovo, Rostov Oblast, a week later. Meanwhile, the Hungarian Second Army and the German 4th Panzer Army had launched an assault on Voronezh, capturing the city on the 5th of July. The initial advance of the Sixth Army was so successful that Hitler intervened and ordered the Fourth Panzer Army to join Army Group South (A) to the south. A massive traffic jam resulted when the Fourth Panzer and the Sixth both required the few roads in the area. Both armies were stopped dead while they attempted to clear the resulting mess of thousands of vehicles. The delay was long, and it is thought that it cost the advance at least one week. With the advance now slowed, Hitler changed his mind and re-assigned the Fourth Panzer Army back to the attack on Stalingrad. By the end of July, the Germans had pushed the Soviets across the Don River. At this point, the Germans began using the armies of their Italian, Hungarian, and Romanian allies to guard their left (northern) flank. The German Sixth Army was only a few dozen kilometers from Stalingrad, and Fourth Panzer Army, now to their south, turned northwards to help take the city. To the south, Army Group A was pushing far into the Caucasus, but their advance slowed as supply lines grew overextended. The two German army groups were not positioned to support one another due to the great distances involved. After German intentions became clear in July, Stalin appointed Marshall Andrei Yeremenko as commander of the Southeastern Front on August 1, 1942. Yeremenko and Commissar Nikita Krushchev were tasked with planning the defense of Stalingrad. The eastern border of Stalingrad was the wide Volga River, and over the river additional Soviet units were deployed. This combination of units became the newly formed 62nd Army, which Yeremenko placed under the command of Lt. Gen. Vasiliy Chuikov on September 11, 1942. The 62nd Army’s mission was to defend Stalingrad at all costs. Before the Wehrmacht reached the city itself, the Luftwaffe had rendered the Volga River, vital for bringing supplies into the city, virtually unusable to Soviet shipping. Between 25 July and 31 July, 32 Soviet ships were sunk with another nine crippled. The battle began with the heavy bombing of the city by the Generaloberst von Richthofen’sLuftflotte 4, which in the summer and autumn of 1942 was the mightiest single air command in the world. Some 1,000 tons were dropped. The city was quickly turned to rubble, although some factories survived and continued production whilst workers joined in the fighting. The Croatian 369th Reinforced Infantry Regiment was the only non-German unitselected by the Wehrmacht to enter Stalingrad city during assault operations. Stalin prevented civilians from leaving the city on the premise that their presence would encourage greater resistance from the city’s defenders. Civilians, including women and children, were put to work building trenchworks and protective fortifications. 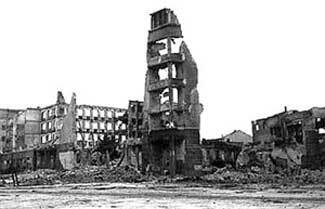 A massive German air bombardment on August 23 caused a firestorm, killing thousands and turning Stalingrad into a vast landscape of rubble and burnt ruins. Ninety percent of the living space in the Voroshilovskiy area was destroyed. The Soviet Air Force, the Voenno-Vozdushnye Sily (VVS), was swept aside by the Luftwaffe. The VVS unit in the immediate area lost 201 aircraft from 23-31 August, and despite meager reinforcements of some 100 aircraft in August, it was with just 192 servicable aircraft which included just 57 fighters. The Soviets poured aerial reinforcements into the Stalingrad area in late September but continued to suffer appalling losses. The Luftwaffe had complete control of the skies. The burden of the initial defense of the city fell on the 1077th Anti-Aircraft (AA) Regiment, a unit made up mainly of young women volunteers who had no training on engaging ground targets. Despite this, and with no support available from other Soviet units, the AA gunners stayed at their posts and took on the advancing Panzers. The German 16th Panzer Division reportedly had to fight the 1077th’s gunners “shot for shot” until all 37 AA batteries were destroyed or overrun. In the beginning, the Soviets relied extensively on “Workers’ militias” composed of workers not directly involved in war production. For a short time, tanks continued to be produced and then manned by volunteer crews of factory workers. They were driven directly from the factory floor to the front line, often without paint or even gunsights. By the end of August, Army Group South (B) had finally reached the Volga, north of Stalingrad. Another advance to the river south of the city followed. By September 1, the Soviets could only reinforce and supply their forces in Stalingrad by perilous crossings of the Volga, under constant bombardment by German artillery and aircraft. On September 5, the Soviet 24th and 66th Armies organised a massive attack against XIV Panzerkorps. The Luftwaffe helped the German forces repulse the offensive by subjecting Soviet artillery positions and defensive lines to heavy attack. The Soviets were forced to withdraw at midday after only a few hours. Of the 120 tanks the Soviets committed, 30 were lost to air attack. Soviet operations were constantly hampered by the Luftwaffe. On 18 September, the Soviet 1st Guards and 24th Army launched an offensive against VIII Armeekorps at Kotluban. VIII Fliegerkorps dispatched wave after wave of Stuka dive-bombers to prevent a breakthrough. The offensive was repulsed, and the Stukas claimed 41 of the 106 Soviet tanks knocked out that morning while escorting Bf 109s destroyed 77 Soviet aircraft, shattering their remaining strength. Amid the debris of the wrecked city, the Soviet 62nd and 64th Armies, which included the Soviet 13th Guards Rifle Division, anchored their defense lines with strongpoints in houses and factories. Fighting was fierce and desperate. The life expectancy of a newly-arrived Soviet private in the city dropped to less than 24 hours, while that of a Soviet officer was about 3 days. Stalin’s Order No. 227 of July 27, 1942, decreed that all commanders who order unauthorized retreat should be subjects of a military tribunal. “Not a step back!” was the slogan. The Germans pushing forward into Stalingrad suffered heavy casualties. German military doctrine was based on the principle of combined-arms teams and close cooperation by tanks, infantry, engineers, artillery, and ground-attack aircraft. To counter this, Soviet commanders adopted the simple expedient of always keeping the front lines as close together as physically possible. Chuikov called this tactic “hugging” the Germans. This forced the German infantry to either fight on their own or risk taking casualties from their own supporting fire; it neutralized German close air support and weakened artillery support. Bitter fighting raged for every street, every factory, every house, basement and staircase. There were fire-fights in the sewers. The Germans, calling this unseen urban warfare Rattenkrieg (“Rat War”), bitterly joked about capturing the kitchen but still fighting for the living-room. Fighting on Mamayev Kurgan, a prominent, blood-soaked hill above the city, was particularly merciless. The position changed hands many times. This division was the 13th Guards Rifle Division, assigned to retake Mamayev Kurgan and Railway Station No. 1, on September 13. Both objectives were successful, only to temporary degrees. The railway station changed hands 14 times in 6 hours. By the following evening, the 13th Guards Rifle Division did not exist, but its men had killed an approximately equal number of Germans. According to Antony Beevor, two bodies were exhumed atop Mamayev Kurgan in 1944 during restoration, one German, one Soviet, who had apparently killed each other by simultaneous bayonet impalement through the chests, and who had at that moment been buried by an exploding artillery shell. At the Grain Silo, a huge grain-processing complex dominated by a single enormous silo, combat was so close that at times Soviet and German soldiers could hear each other breathe. Combat raged there for weeks. When German soldiers finally took the position, only forty Soviet bodies were found, though the Germans had thought there to be many more Soviet soldiers present due to the ferocity of Soviet resistance. The Soviets burned the heaps of grain as they retreated. In another part of the city, a Soviet platoon under the command of Yakov Pavlov turned an apartment building into an impenetrable fortress. The building, later called “Pavlov’s House,” oversaw a square in the city center. The soldiers surrounded it with minefields, set up machine-gun positions at the windows, and breached the walls in the basement for better communications. They were not relieved, and not significantly reinforced, for two months. Well after the Battle, Chuikov liked to joke, perhaps accurately, that more Germans died trying to capture Pavlov’s House than died capturing Paris. According to Beevor, after each wave, throughout the second month, of the Germans’ repeated, persistent assaults against the building, the Soviets had to run out and kick down the piles of German corpses in order for the machine and anti-tank gunners in the building to have clear firing lines across the square. Sgt. Pavlov was awarded the “Hero of the Soviet Union” for his actions. With no end in sight, the Germans started transferring heavy artillery to the city, including the gigantic 800 mm railroad gun nicknamed Dora. The Germans made no effort to send a force across the Volga, allowing the Soviets to build up a large number of artillery batteries there. Soviet artillery on the eastern bank continued to bombard the German positions. The Soviet defenders used the resulting ruins as defensive positions. German tanks became useless amid heaps of rubble up to 8 meters high. When they were able to move forward, they came under Soviet antitank fire from wrecked buildings. Soviet snipers also successfully used the ruins to inflict heavy casualties on the Germans. The most successful sniper was Vasily Zaytsev who is also the most famous. Zaytsev was credited with 242 confirmed kills during the battle and a grand total of more than 300; he was also credited with killing a specially-sent, though potentially fictional German sniper known by the names Erwin König and Heinz Thorvald. Zaytsev fixed a standard Moisin-Nagant rifle scope to a Soviet 20mm anti-tank rifle for use against Germans hiding behind walls under window sills. The 20mm rounds easily penetrated the brick and the soldier behind it. For both Stalin and Hitler, the battle of Stalingrad became a prestige issue in addition to the actual strategic significance of the battle. The Soviet command moved the Red Army’s strategic reserves from the Moscow area to the lower Volga, and transferred aircraft from the entire country to the Stalingrad region. The strain on both military commanders was immense: Paulus developed an uncontrollable tic in his eye, which eventually afflicted the left side of his face, while Chuikov experienced an outbreak of eczema that required him to bandage his hands completely. Troops on both sides faced the constant strain of close-range combat. Determined to crush Soviet resistance, Luftflotte 4s Stukawaffe flew 700 individual sorties against Soviet positions at the Dzherzhinskiy Tractor Factory on 5 October. Several Soviet regiments were wiped out; the entire staff of the Soviet 339th Infantry Regiment were killed the following morning during an air raid. By mid-October, the Luftwaffe intensified its efforts against remaining Red Army positions holding the west bank. By now, Soviet aerial resistance had ceased to be effective. Luftflotte 4 flew 2,000 sorties on 14 October and 600 tons of bombs were dropped while German infantry surrounded the three factories. Stukageschwader 1, 2, and 77 had silenced Soviet artillery on the eastern bank of the Volga to a large degree before turning their attention to the shipping that was once again trying to reinforce the narrowing Soviet pockets of resistance. The 62nd Army had been cut in two, and, due to intensive air attack against its supply ferries, were now being paralyzed. With the Soviets forced into a 1,000-yard (910 m) strip of land on the western bank of the Volga, over 1,208 Stuka missions were flown in an effort to eliminate them. Despite the heavy air bombardment (Stalingrad suffered heavier bombardment than that inflicted on Sedan and Sevastopol), the Soviet 62 Army, with just 47,000 men and 19 tanks, prevented the VI Armee and IV Panzerarmee from wrestling the west bank out of Soviet control. The Luftwaffe remained in command of the sky into early November, and Soviet aerial resistance during the day was nonexistent, but after flying 20,000 individual sorties, its original strength of 1,600 serviceable aircraft had fallen 40% to 950. The Kampfwaffe (bomber force) had been hardest hit, having only 232 out of a force of 480 left. Despite enjoying qualitative superiority against the VVS and possessing eighty percent of the Luftwaffe’s resources on the Eastern Front, Luftflotte 4 could not prevent Soviet aerial power from growing. By the time of the counter-offensive, the Soviets were superior numerically. The Soviet bomber force, the Aviatsiya Dalnego Destviya (ADD), having taken crippling losses over the past 18 months, was restricted to flying at night. The Soviets flew 11,317 sorties in this manner, from 17 July to 19 November over Stalingrad and the Don-bend sector. These raids caused little damage and were of nuisance value only. The situation for the Luftwaffe was now becoming increasingly difficult. On 8 November substantial units from Luftflotte 4 were removed to combat the American landings in North Africa. The German air-arm found itself spread thin across Europe, and struggling to maintain its strength in the other southern sectors of the Soviet-German front. After three months of carnage and slow and costly advance, the Germans finally reached the river banks, capturing 90% of the ruined city and splitting the remaining Soviet forces into two narrow pockets. In addition, ice-floes on the Volga now prevented boats and tugs from supplying the Soviet defenders across the river. 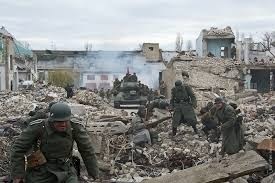 Nevertheless, the fighting, especially on the slopes of Mamayev Kurgan and inside the factory area in the northern part of the city, continued as fiercely as ever. The battles for the Red October Steel Factory, the Dzerzhinsky tractor factory, and the Barrikady gun factory became world famous. While Soviet soldiers defended their positions and took the Germans under fire, factory workers repaired damaged Soviet tanks and other weapons close to the battlefield, sometimes on the battlefield itself. These civilians also volunteered as tank crews to replace the dead and wounded, though they had no experience or training in operating tanks during combat. Recognizing that German troops were ill prepared for offensive operations during the winter, the Stavka decided to conduct a number of offensive operations of its own to exploit this weakness, with the recognition that most of the German troops were redeployed elsewhere on the southern sector of the Eastern Front. Seen in post-war history as a pivotal strategic period of war that began the Second Period of the Great Patriotic War (19 November 1942 - 31 December 1943), these operations would open the Winter Campaign of 1942-1943 (19 November 1942 - 3 March 1943) taking on the strategic and operational planning structure below, employing several Fronts, and some 15 Armies. The German offensive to take Stalingrad had been halted by a combination of stubborn Red Army resistance inside the city and local weather conditions. The Soviet counter-offensive planning used deceptive measures that eventually trapped and destroyed the 6th Army and other Axis forces around the city, becoming the second large scale defeat of the German Army during Second World War. During the siege, the German, Italian, Hungarian, and Romanian armies protecting Army Group B’s flanks had pressed their headquarters for support. The Hungarian Second Army, consisting of mainly ill-equipped and ill-trained units, was given the task of defending a 200 km section of the front north of Stalingrad between the Italian Army and Voronezh. This resulted in a very thin line, with some sectors where 1–2 km stretches were being defended by a single platoon. Soviet forces held several bridgeheads on the western bank of the river and presented a potentially serious threat to Army Group B. Similarly, on the southern flank of the Stalingrad sector the front south-west of Katelnikovo was held only by the Romanian VII Corps, and beyond it a single German 16th Motorized Infantry Division. However, Hitler was so focused on the city itself, that requests from the flanks for support were refused. The chief of the Army General Staff, Franz Halder, expressed concerns about Hitler’s preoccupation with the city, pointing at the Germans’ weak flanks, claiming that if the situation on the flanks was not rectified then “there would be a disaster”. Hitler had claimed to Halder that Stalingrad would be captured and the weakened flanks would be held with “national socialist ardour, clearly I cannot expect this of you (Halder)”. Halder was then replaced in mid October with GeneralKurt Zeitzler. In autumn the Soviet generals Aleksandr Vasilyevskiy and Georgy Zhukov, responsible for strategic planning in the Stalingrad area, concentrated massive Soviet forces in the steppes to the north and south of the city. The German northern flank was particularly vulnerable, since it was defended by Italian, Hungarian, and Romanian units that suffered from inferior training, equipment, and morale when compared with their German counterparts. This weakness was known and exploited by the Soviets, who preferred to face off against non-German troops whenever it was possible, just as the British preferred attacking Italian troops, instead of German ones, whenever possible, in North Africa. The plan was to keep pinning the Germans down in the city, then punch through the overstretched and weakly defended German flanks and surround the Germans inside Stalingrad. During the preparations for the attack, Marshal Zhukov personally visited the front, which was rare for such a high-ranking general. The operation was code-named “Uranus” and launched in conjunction with Operation Mars, which was directed at Army Group Center. The plan was similar to Zhukov’s victory at Khalkin Gol three years before, where he had sprung a double envelopment and destroyed the 23rd Division of the Japanese army. On November 19, the Red Army unleashed Uranus. The attacking Soviet units under the command of Gen. Nikolay Vatutin consisted of three complete armies, the 1st Guards Army, 5th Tank Army, and 21st Army, including a total of 18 infantry divisions, eight tank brigades, two motorized brigades, six cavalry divisions and one anti-tank brigade. The preparations for the attack could be heard by the Romanians, who continued to push for reinforcements, only to be refused again. Thinly spread, outnumbered and poorly equipped, the Romanian Third Army, which held the northern flank of German Sixth Army, was shattered. On November 20, a second Soviet offensive (two armies) was launched to the south of Stalingrad, against points held by the Romanian IV Corps. The Romanian forces, made up primarily of infantry, collapsed almost immediately. Soviet forces raced west in a pincer movement, and met two days later near the town of Kalach, sealing the ring around Stalingrad. The Russians later reconstructed the link up for use as propaganda, and the piece of footage achieved worldwide fame. Because of the Soviet pincer attack, about 230,000 German and Romanian soldiers, as well as the Croatian 369th Reinforced Infantry Regiment and other volunteer subsidiary troops, found themselves trapped inside the resulting pocket. Inside the pocket (German: kessel) there also were the surviving Soviet civilians—around 10,000, and several thousand Soviet soldiers the Germans had taken captive during the battle. Not all German soldiers from Sixth Army were trapped; 50,000 were brushed aside outside the pocket. The encircling Red Army units immediately formed two defensive fronts: a circumvallation facing inward, to defend against any breakout attempt, and a contravallation facing outward, to defend against any relief attempt. Adolf Hitler had declared in a public speech (in the Berlin Sportpalast) on September 30 that the German army would never leave the city. At a meeting shortly after the Soviet encirclement, German army chiefs pushed for an immediate breakout to a new line on the west of the Don. But Hitler was at his Bavarian retreat of Obersalzberg in Berchtesgaden with the head of the Luftwaffe, Göring. When asked by Hitler, Göring replied, after being convinced by Hans Jeschonnek, that the Luftwaffe could supply the Sixth Army with an “air bridge”. This would allow the Germans in the city to fight on while a relief force was assembled. A similar plan had been used successfully a year earlier at the Demyansk Pocket, albeit on a much smaller scale: it had been only an army corps at Demyansk as opposed to an entire army. Also, Soviet fighter forces had improved considerably in both quality and quantity in the intervening year. But the mention of the successful Demyansk air supply operation reinforced Hitler’s own views, and was endorsed by Hermann Göring several days later. The head of the Fourth Air Fleet (Luftflotte 4), Wolfram von Richthofen, tried to have this decision overturned without success. The Sixth Army would be supplied by air. The Sixth Army was the largest unit of this type in the world, almost twice as large as a regular German army. Also trapped in the pocket was a corps of the Fourth Panzer Army. It should have been clear that supplying the pocket by air was impossible -- the maximum 117.5 tons they could deliver a day was less than the 800 tons/day needed by the pocket. To supplement the limited number of Junkers Ju 52 transports, the Germans equipped aircraft wholly inadequate for the role, such as the bomber He-177 (some bombers performed adequately -- the Heinkel He-111 proved to be quite capable and was a lot faster than the Ju 52). But Hitler backed Göring’s plan and reiterated his order of “no surrender” to his trapped armies. The air supply mission failed. Appalling weather conditions, technical failures, heavy Soviet anti-aircraft fire and fighter interceptions led to the loss of 488 German aircraft. The Luftwaffe failed to achieve even the maximum supply capacity of 117 tons that it was capable of. An average of 94 tons of supplies per day was delivered to the trapped German Army. Even then, it was often inadequate or unnecessary; one aircraft arrived with 20 tonnes of Vodka and summer uniforms, completely useless in their current situation. The transport aircraft that did land safely were used to evacuate technical specialists and sick or wounded men from the besieged enclave (some 42,000 were evacuated in all). The Sixth Army slowly starved. Pilots were shocked to find the troops assigned to offloading the planes too exhausted and hungry to unload food. General Zeitzler, moved by the troops’ plight at Stalingrad, began to limit himself to their slim rations at meal times. After a few weeks of such a diet he’d grown so emaciated that Hitler, annoyed, personally ordered him to start eating regular meals again. The expense to the Transportgruppen was heavy. Some 266 Junkers Ju 52s were destroyed, one-third of the fleets strength on the Soviet-German front. The He 111 gruppen lost 165 aircraft in transport operations. Other losses included 42 Junkers Ju 86s, nine Fw 200 “Condors”, five He 177 bombers and a single Ju 290. The Luftwaffe also lost close to 1,000 highly experienced bomber crew personnel. So heavy were the Luftwaffe’s losses that four of Luftflotte 4s transport units (KGrzbV 700, KGrzbV 900, I./KGrzbV 1 and II./KGzbV 1) were “formally dissolved”. Soviet forces consolidated their positions around Stalingrad, and fierce fighting to shrink the pocket began. Operation Wintergewitter (Operation Winter Storm), a German attempt to relieve the trapped army from the South, was successfully fended off by the Soviets in December. The full impact of the harsh Russian winter set in. The Volga froze solid, allowing the Soviets to supply their forces more easily. The trapped Germans rapidly ran out of heating fuel and medical supplies, and thousands started to die of frostbite, malnutrition, and disease. On December 16, the Soviets launched a second offensive, Operation Saturn, which attempted to punch through the Axis army on the Don and take Rostov. If successful, this offensive would have trapped the remainder of Army Group South, one third of the entire German Army in Russia, in the Caucasus. The Germans set up a “mobile defense” in which small units would hold towns until supporting armor could arrive. The Soviets never got close to Rostov, but the fighting forced von Manstein to extract Army Group A from the Caucasus and re-establish the frontline some 250 km away from the city. The Tatsinskaya Raid also caused significant losses to Luftwaffe’s transport fleet. The Sixth Army now was beyond all hope of German reinforcement. The German troops in Stalingrad were not told this however, and continued to believe that reinforcements were on their way. Some German officers requested that Paulus defy Hitler’s orders to stand fast and instead attempt to break out of the Stalingrad pocket. Paulus refused, as he abhorred the thought of disobeying orders. Also, whereas a breakout may have been possible in the first few weeks, at this late stage, Sixth Army was short of the fuel required for such a breakout. The German soldiers would have faced great difficulty breaking through the Soviet lines on foot in harsh winter conditions. German POWs: Field Marshal Friedrich Paulus (center) with his general staff. The Germans inside the pocket retreated from the suburbs of Stalingrad to the city itself. The loss of the two airfields at Pitomnik on 16 January and Gumrak on the 25 January meant an end to air supplies and to the evacuation of the wounded. Other sources indicate Luftwaffe’s last flight from Gumrak was night 21st to 22nd of January 1943. Third and last serviceable runway was Stalingradskaja flight school which reportedly had last Luftwaffe landings and takeoff night 22nd to 23rd of January 1943. After daytime 23rd of January 1943 there were no more reported landings except for continuous air drops of ammunition and food until the end. The Germans were now not only starving, but running out of ammunition. Nevertheless they continued to resist stubbornly, partly because they believed the Soviets would execute those who surrendered. In particular, the so-called “HiWis”, Soviet citizens fighting for the Germans, had no illusions about their fate if captured. The Soviets, in turn, were initially surprised by the large number of German forces they had trapped, and had to reinforce their encircling forces. Bloody urban warfare began again in Stalingrad, but this time it was the Germans who were pushed back to the banks of the Volga. They fortified their positions in the factory districts and the Soviets encountered almost the same tooth-and-nail ferocity that they themselves displayed a month earlier. The Germans adapted a simple defense of fixing wire nets over all windows to protect themselves from grenades. The Soviets responded by fixing fish hooks to the grenades so they stuck to the nets when thrown. The Germans now had no usable tanks in the city. Those tanks which still functioned could at best be used as stationary cannons. The Soviets did not bother employing tanks in areas where the urban destruction ruined their mobility. A Soviet envoy made Paulus a generous surrender offer—that if he surrendered within 24 hours, the Germans would receive a guarantee of safety for all prisoners, medical care for the German sick and wounded, a promise that prisoners would be allowed to keep their personal belongings, “normal” food rations, and repatriation to whatever country they wished to go to after the war—but Paulus, ordered not to surrender by Adolf Hitler, did not reply, ensuring the destruction of the 6th Army. Hitler promoted Friedrich Paulus to Generalfeldmarschall on January 30, 1943, (the 10th anniversary of Hitler coming to power). Since no German Field Marshal had ever been taken prisoner, Hitler assumed that Paulus would fight on or take his own life. Nevertheless, when Soviet forces closed in on Paulus’ headquarters in the ruined GUM department store the next day, Paulus surrendered. The remnants of the German forces in Stalingrad surrendered on February 2; 91,000 tired, ill, and starving Germans were taken captive. 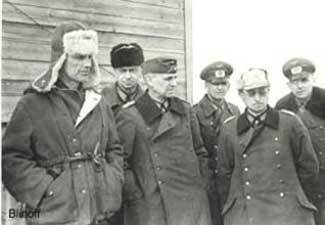 To the delight of the Soviet forces and the dismay of the Third Reich, the prisoners included 22 generals. Hitler was furious at the Field Marshal’s surrender and confided that “Paulus stood at the doorstep of eternal glory but made an about-face”. According to the German documentary film Stalingrad, over 11,000 German and Axis soldiers refused to lay down their arms at the official surrender, seemingly believing that fighting to the death was better than what seemed like a slow end in Soviet camps. These forces continued to resist until early March 1943, hiding in cellars and sewers of the city with their numbers being diminished at the same time by Soviet forces clearing the city of remaining enemy resistance. By March, what remained of these forces were small and isolated pockets of resistance that surrendered. According to Soviet intelligence documents shown in the documentary, 2,418 of the men were killed, and 8,646 were captured. Only 5,000 of the 91,000 German prisoners of war survived their captivity and returned home. Already weakened by disease, starvation and lack of medical care during the encirclement, they were sent to labour camps all over the Soviet Union, where most of them died of overwork and malnutrition. A handful of senior officers were taken to Moscow and used for propaganda purposes and some of them joined National Committee for a Free Germany. Some, including Paulus, signed anti-Hitler statements which were broadcast to German troops. General Walther von Seydlitz-Kurzbach offered to raise an anti-Hitler army from the Stalingrad survivors, but the Soviets did not accept this offer. It was not until 1955 that the last of the handful of survivors were repatriated. The German public was not officially told of the disaster until the end of January 1943, though positive reports in the German propaganda media about the battle had stopped in the weeks before the announcement. It was not the first major setback of the German military, but the crushing defeat at Stalingrad was unmatched in scale. On February 18, the minister of propaganda, Joseph Goebbels, gave his famous Sportpalast speech in Berlin, encouraging the Germans to accept a total war which would claim all resources and efforts from the entire population. The aftermath of the Battle of Stalingrad.